Along with about 300 other garden writers, horticulturists and bloggers, I get sent sample plants from Proven Winners each year. PW is one of the largest plant brands in the country and introduces a couple of dozen new plants each year. The sample plants are scheduled to be in garden centers and nurseries next year. 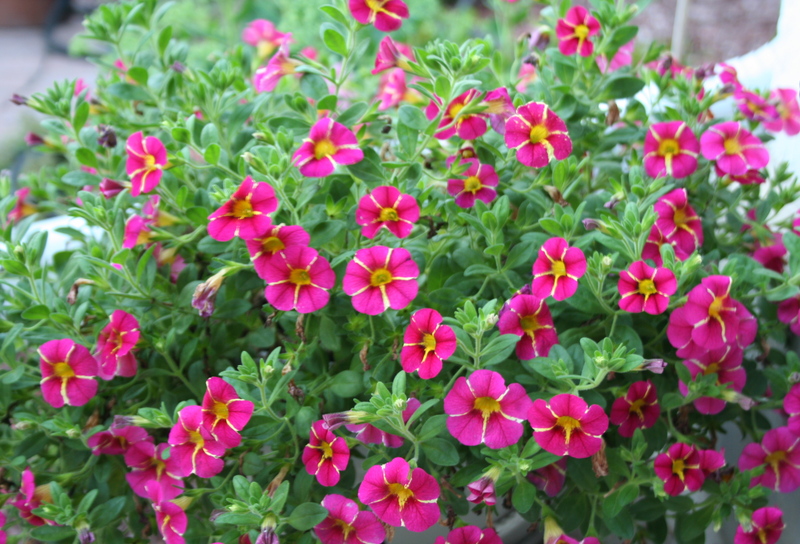 This year’s group of plant includes several that are performing well in my garden, but the one I really like is this calibrachoa, Superbells® Cherry Star. I put it in a hanging basket and it has been flowering and blooming like crazy ever since. It’s a striped plant with yellow lines on a bright pink bloom. Like other Superbells, it is self-cleaning, meaning you don’t need to deadhead it. Other versions of the same plant feature deep purple bloom (Grape Punch) and a pinky peach bloom (Sweet Tart). These dark pink ones that have simply blown me away. I’ll let you know how it holds up through the latter part of the summer, but for now – this is one to look for next spring! Disclaimer: I was sent the plants for free, but am under no obligation to write about them and have no financial relationship with Proven Winners. They look like a mix of petunia/nasturtium, in a way. How big are the flowers? The scale is a little hard to tell in the photo. Proven Winners gave the Seattle Fling participants each a Blackberry Punch Calibrachoa as a souvenir of our Seattle garden days. I left mine with a Tacoma cousin which is a good thing since I didn’t even make it home with my luggage. A first for me. Next year the bloggers are meeting up in Ashville. The Biltmore and more! Penny — They are pretty tiny flowers, about an inch or less across. Pat — Blackberry sounds colorful! Ashville will be a great place for garden touring. I hope I can make in next year.